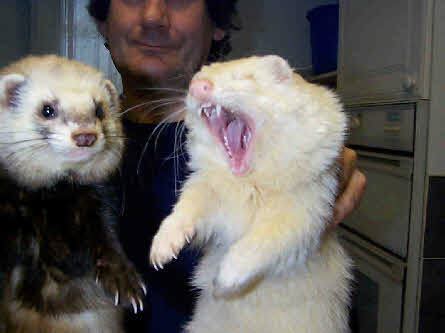 Pictured two friends Sandy yawning, next to Skippy. Sandy exhibits the formidable teeth possessed by ferrets, they are capable of inflicting nasty wounds, although a well treated ferret will not bite.. Intact Hobs ( males with testicles) should be housed separately, although they can be exercised together under close supervision, but there is the possible risk of fighting. Castrated Hobs can be housed together as can Jills (Females) or as Jill/Castrated Hob combinations. Note of caution: it is not wise to put any type of pet animal near to your eyes, you could be badly injured as a consequence.